Taormina has one truly unmissable tourist sight, its Greek Theatre, but the town, its location and its views are attractions in themselves. It's easy to spend a couple of days pottering around the town and its environs; longer if you plan to relax by the sea or a pool, or to roam further afield. Taormina's great popularity over more than a century is largely about its atmosphere, views and charm. Although in size it would generally be considered a small town, the historic centre feels like a well-to-do hill village turned into a resort with a glossy sheen of glamour. Exploring the historic centre can take as much as several hours, if you are looking around shops and studios, stopping at a cafe, buying an ice-cream and admiring views. The handsome principal thoroughfare, Corso Umberto, is mostly pedestrianised and ideal for strolling and window-shopping. Halfway along is the panoramic Piazza IX Aprile, a focal point for visitors, where you can sit on benches and admire the town's wonderful views over the sea and towards Etna. A drink at the outdoor tables of the historic Caffè Wunderbar is a pricey treat, but you'll be following in the footsteps of famous visitors including Tenessee Williams and Elizabeth Taylor. 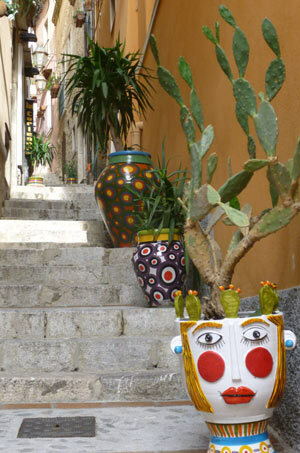 Picturesque alleys and staircases above and below the Corso are interesting to explore, while if you want to stretch your legs further there are attractive walks up into the hills, or down to the sea. Given its compact size, Taormina has a huge range of bars, cafes and restaurants where you can while away pleasant hours while admiring the views. Shop sell everything from cheap souvenirs to high-end jewellery. You can find designer boutiques, including big names, as well as more 'local' businesses selling art works and pretty traditional ceramics. Dining options range from restaurants offering Sicilian, Italian and international cuisine, to street food outlets and gelaterie offering spectacular gelato flavours and ice slush granite. Corso Umberto runs through the historic centre between the two historic town gateways, Porta Catania to the south-west and Porta Messina to the north-east. Close to the Porta Catania end of the street is Taormina's picturesque cathedral, (Cattedrale/Duomo), dedicated to St Nicholas. Attractive inside and out, the building was founded in the thirteenth century on the site of an earlier church, was rebuilt in the fiteenth-sixteenth centuries, and has features from several eras including columns of pink Taormina marble which originally came from the Greek Theatre. Outside the church, the dignified Piazza Duomo features one of the most recognisable symbols of the town, a seventeenth-century fountain bearing a very curious sculpture of a female version of a Minotaur. The fountain is known as the Quattro Fontane for its four subsidiary spouts. Another, very different, church can be found by energetic visitors up the slopes above the town. A stepped footpath climbs up to the Santuario della Madonna della Rocca, a tiny church cut into the rocks. A little further up Monte Tauro, the mountain across whose slopes Taormina is spread, is a ruined fortress, the Castello Saraceno, theoretically open to the public, though closed for restoration at the time of writing. This outing uphill from the centre of Taormina is not particularly demanding, and it affords marvellous views in several directions. Taormina's greatest tourist attraction is the Teatro Greco, a Greco-Roman theatre built into a rocky hillside just a couple of minutes off Corso Umberto. 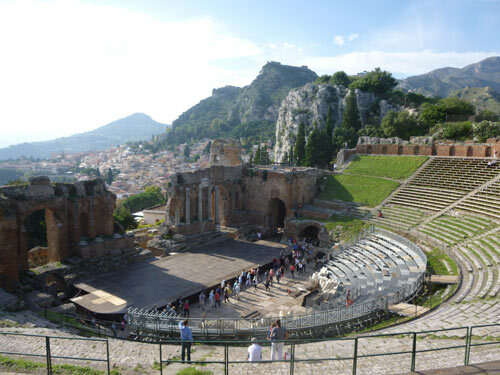 Although generally known as the 'Greek' Theatre, Taormina's historic open-air theatre owes much of its present appearance to the Romans, the Greeks' successors in Sicily. Designed with an unsurpassable backdrop of blue sea, coastline, distant smoking Etna, and inland mountains, the theatre was founded by the Greeks in the third century BC. In the first century AD, when Taormina was a significant Roman town, the Romans adapted the theatre to suit their more bloodthirsty tastes, stripping out seating to make more room for gladiatorial shows. Nowadays, dodging tour parties, you can wander around the theatre complex: the stage and backstage areas, as well as panoramic viewpoints up on the crags behind, each one breathtaking due to the theatre's position on a rocky spur of land extending towards the sea, far below. The curving rows of seats are a suntrap and a wonderful place to sit and dream away an hour or two. 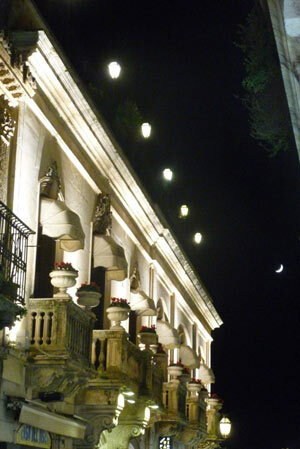 In the summer an arts festival (Taormina Arte) takes place here. 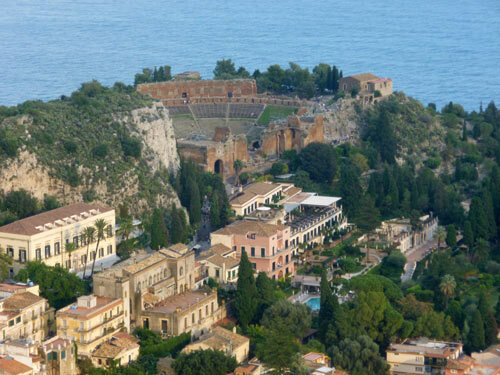 As well as the Greek Theatre, there are several other archaeological sites to be discovered around Taormina. Not far from the Teatro Greco, around the back of the Chiesa di Santa Caterina, are the ruins of a smaller Augustan-era theatre, which can be viewed through railings on the street (a small section of paving is also visible inside the church). Below Corso Umberto you'll find the 'Naumachie' (on Via Naumachie), a massive wall whose arched niches concealed a vast water cistern as well as buttressing the road above. The strip of land in front of this wall has been made into a narrow public garden. A number of ancient necropoli are dotted around the area: some Byzantine grave-niches are visible on Via Pirandello just below the Belvedere, and a more dramatic necropolis above the town can be seen from the Castelmola - Taormina footpath. If you're interested in the ancient world and Sicily's Greek history, you should also fit in a visit to the display cabinets on Isola Bella, and the extensive ruins of Greek Naxos at Giardini Naxos, both described below. It would be hard to beat the views from Taormina on a clear day. Some of the best places for enjoying the vista are the panoramic terrace of Piazza IX Aprile on Corso Umberto, the Teatro Greco and the public gardens. A walk down Via Pirandello or Via Guardiola Vecchia brings you to the Belvedere where the two roads meet. This look-out point offers seats to sit on and a great view along the coastline. For views over Taormina itself, head uphill to the Madonna della Rocca, or higher, to the village of Castelmola. If you're prepared to splash out on a treat, the Grand Hotel Timeo (see Where to stay in Taormina) is a wonderful venue for an aperitivo, with bar tables on a terrace with views over the hotel's gardens and towards Etna which are particularly glorious at sunset. Be warned: this is a lavish but expensive experience. Known by various names including the Villa Comunale, the Giardino Trevelyan and the Parco Duchi di Cesarò, the public park on Via Bagnoli Croce is a pretty and peaceful spot. An English-style garden, it was designed by Florence Trevelyan, who lived in Taormina at the end of the nineteenth century. A panoramic walkway lined with benches faces the view over the sea and Etna, while flower-beds, lawns, hedges, trees and bushes spread over the large terrace. There are several fascinating follies to admire, including cottages and towers, as well as a collection of caged birds, some old artillery, a children's play area and a bar (the latter two are not always open). Taormina has small but interesting collections of archaeological and folk artefacts which have been shifted around different exhibition venues in recent years - asking at the tourist office or your hotel should help you to locate current exhibitions. At the time of writing you can see a few showcases of archaeological finds at Isola Bella (see below), including a rather exciting sword, probably dating to the Byzantine era, which was found in the sea near the island. Other exhibits can be seen in the little Antiquarium within the Teatro Greco complex. Palazzo Corvaja, home of the tourist information office, also houses exhibitions. Potentially even more interesting is the Museo Siciliano di Arti e Tradizioni Popolari, a collection relating to more recent 'folk' history of Taormina and the surrounding area. Housed at the time of writing in the ex Chiesa di San Francesco di Paolo, outside the Porta Catania up Viale Apollo Arcageta, this is a rather charming overview of 'people's history'. There are not-particularly-expert paintings of Sicilian families, wooden carvings of saints and odd bits of furniture. Best of all are the ex-votos, small and often amateurish paintings produced as offerings, depicting mishaps and tragedies averted, with thanks to the saint who saved the day. Often touching, sometimes amusing, these include scenes of cat attacks, lava-flows from the erupting Etna, a tennis accident and a father shooting and injuring the son he mistook for an intruder. If you're interested in the history, traditions and everyday life of Sicily, it is really worth seeking out this under-visited attraction (ask locally about the current opening times, or any changes to location). 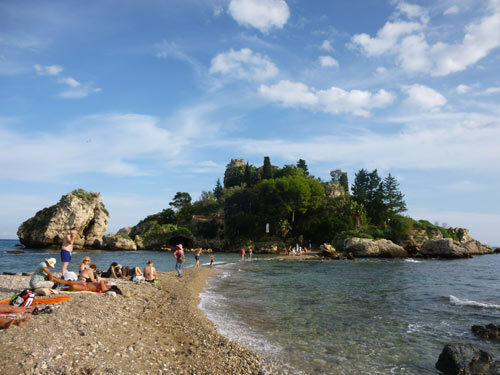 Taormina is situated high above the sea, with views over the beaches below, including the beautiful bay of Isola Bella. Isola Bella itself is a small and rocky islet which, like the public gardens, once belonged to Florence Trevelyan, who built a small house and planted a garden here. Nowadays it is a curious and atmospheric spot, with rocks, tropical vegetation, crumbling sculptural features and empty pools, grottoes and summer houses. Inside the uninhabited villa is a small exhibition of historic artefacts. As well as being an unusual and eccentric garden/museum, it may be the only tourist attraction approached by splashing through waves, depending on sea conditions: attached by a narrow spit of sand and pebbles, visitors have to hoik up their clothing, take off their shoes and wade from the beach. There's a small admission charge, which is well worth paying for the experience. For the energetic it's possible to descend to the sea on foot, either to the bay at Mazzarò or that of Isola Bella (from the Belvedere on Via Luigi Pirandello). A cable-car (funivia) runs from Taormina down to Mazzarò, and both public and tour buses connect Taormina with the seashore. Castelmola is a classic Sicilian hill village perched dramatically on a rocky hilltop above Taormina. It's a popular excursion from Taormina, reachable by bus or on foot. There are a few bars and trattorie for visitors, but it also retains an authentic and historic atmosphere. 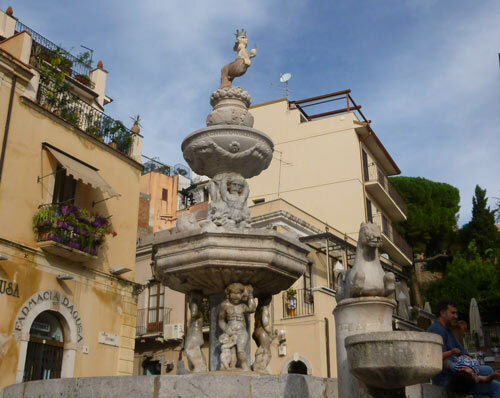 > Read more: an attractive walk down the hill above Taormina. Spread along wide bay below Taormina, south of the beaches described above, Giardini Naxos is a seaside resort in its own right. As well as a beach and boat trips, it also offers the chance to explore the ruins of the first ancient Greek colony in Sicily. If you're staying more than two or three days in Taormina you may fancy an excursion of Sicily's attractions. A number of organised tourist excursions depart from the bus terminal, to destinations including Agrigento, Piazza Armerina, a 'Montalbano' tour and Savoca. These should be booked in advance, either online or in Taormina itself. If you're staying only in Taormina, and have no plans to return to Sicily, these coach trips offer a good chance to see some more of the island. But bear in mind that some of the destinations visited are a long drive away and the outings may be tiring as well as expensive. The excursions mentioned above are definitely easier to make on an organised trip. But there are other destinations which are straightforward and much cheaper to visit by public transport, which will also give you more flexibility. Frequent buses run to the interesting city of Catania. By catching a local bus or taxi down to Taormina's railway station, you can easily and comfortably visit Catania or Messina or Siracusa, all on the same railway line. 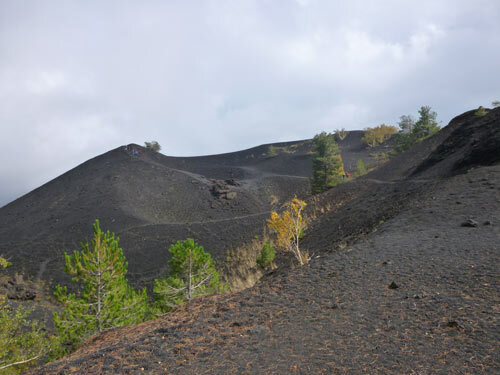 One of the most interesting day trips from Taormina, and one for which Taormina is a very sensible base, is to Sicily's great, active volcano, (Mount) Etna. Local firms organise outings in coaches and jeeps, with a range of options, from adventurous ascents which approach the summit, to educational tours of the volcano's slopes, visiting the lava trails from past eruptions as well as sampling local food and drink. I took a small-group tour with Etna People, which was a fascinating and informative experience. A selection of the best (and best value) Taormina hotels and B&Bs, with reviews and online booking.